This Iguana looks pretty cool basking under the gloomy sky. An amazing creature captured with good sharpness and details and the shallow depth in BG makes your main subject well isolated. This is a razor sharp closeup capture from a interesting reptile species, Jusni! The sharpness and POV are well chosen, and colors are natural. The DOF is well maintained with great color contrast. A superb macro of this iguana with wonderful details of the face. Good subtle lighting rendering perfect exposure on the skin. Marvelous colors amd pin sharp eye. A perfect crop and good shallow focusing. Nice shot with beautiful colors and an interesting subject. Excellent focus and good POV! 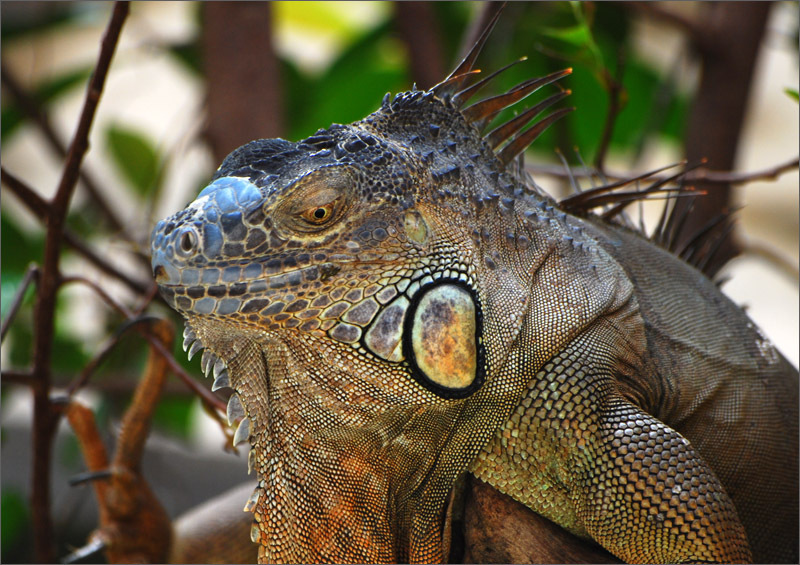 Nice pose captured, well exposed showing the Iguanas patterns and colouration.A neat, clear and well focused image. PS. i seem to be having plenty of problems uploading photos and sometimes opening members pics, do you have any similar problems. You nailed this big guy beautifully in natural surroundings seemingly enjoying the coolness of some shade up in that tree , you know the more i look at this iguana and the less i think it is a pretty animal but it does not make it any less a wonderfully adapted creature in its own environment .